Now you have decided to try for a baby, you will want to prepare your body and ensure you have a healthy diet and lifestyle. 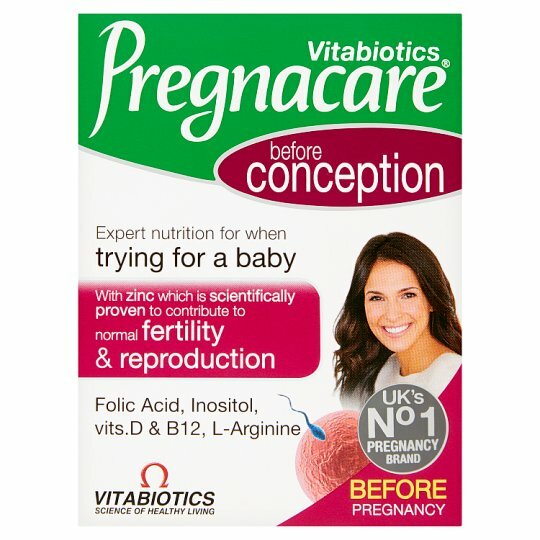 Pregnacare® Conception has been specially formulated on the basis of worldwide studies to help build and safeguard your nutritional stores ready for pregnancy. Zinc is scientifically proven to contribute to normal fertility and reproduction. The exact level recommended by the UK Department of Health for women from the start of trying to conceive. Supplement folic acid† intake increases maternal folate status. Low maternal folate status is a risk factor in the development of neural tube defects in the developing foetus. This product is designed for women of child-bearing age. †The beneficial is obtained with a supplemental folic acid daily intake of 400µg for at least one month before and up to three months after conception. One tablet per day, with your main meal. Swallow with water or a cold drink. Not to be chewed. Do not exceed recommended intake. To be taken only on a full stomach. There is no need to take an additional multivitamin. Use Pregnacare® Conception as soon as you start trying for a baby. To help prepare your body, it can even be used up to 3 months before you start to try for a baby. Once confirmed you are pregnant, you can continue to use any remaining tablets, before taking Pregnacare® Original, Plus or Max. Pregnacare® Conception is a nutrient based, scientifically researched formula without any drugs or hormones. It contains no ingredients known to cause irregularity in the monthly cycle. A change in the monthly cycle has been noticed by some women at the same time as using this product. If you experience a delay or change in your monthly cycle, this may not necessarily mean you are pregnant and it is advised to take a pregnancy test and speak to your doctor or health professional. Food supplements must not replace a varied and balanced diet and a healthy lifestyle. As with other food supplements, consult your doctor or pharmacist before using if you are under medical supervision, have epilepsy, a thyroid condition, harmochromatosis, suffer from food allergies, or are allergic to any of the ingredients. This product contains iron, which if taken in excess, may be harmful to very young children.